Forever out of place: Review time! These are makeup products I have bought lately, mainly to substitute stuff I had finished or had expired. I was very happy with some of them, and very bummed with others. 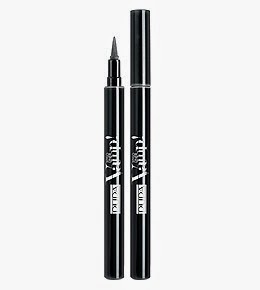 I needed an "easy" liquid liner, and I found it! It's unfussy, goes on well and has a decent staying power. The only negative thing is that sometimes I have to trace the line again over the first line, as if the line wasn't filled enough at the first try (hope I make sense). Overall, a good product, and I paid about 11€ for it, which is not too much here. Maybelline Volum'Express Mascara The Classic. I bought it out of frustration after thrying the NYC one (see below). It's a good one, it does its job, and I found a two-for-one deal. It's not going to change my life, but it's a great basic mascara. It's pretty, and I really wanted to like it, especially because on the web it looks like it's a favorite by many. I picked the peach color. But it really doesn't do anything for me. It has no lasting power. It's not really hydrating. I much prefer my classic Labello lip balm, which costs about 1/5 of this (it's something like the equivalent of classic Chapstick). It's very cheap, and now I know why. It looks like I didn't even try applying mascara (husband asked why I wasn't wearing mascara!) and whatever remains on my lashes manages to go into my eyes shorty after. Definitely a no-no! I'm always on the hunt for a good liquid liner! Thanks for the tip! An outfit . 30 weeks!